30% off everything in the Autoshow! 1) Go to your Settings menu for HUD and make sure Notifications are turned On. If you have 550 cars in your garage, auction/remove one or two. 3) Reboot before starting the challenges - hold the power button on your console until it shuts off. Also reboot any Win10 computers connected to the same router. 4) Use the dashboard Achievement tracker to see if you are progressing through # requirements, or use a Bucket List with skills requirement. 5) Reboot again if you see an Achievement but no gift. -If you've had trouble with Forzathon before or if this is a new issue. Will the 918 be available to buy or will we have to complete a forzathon challenge? I'm hoping at least one of those Porsches is won without online races. More or all is better, but I'll be happy with at least one. And auction house to get the rest. Does this mean that we will have to repeat the Bucket Lists we have done 'til it pops? If so I will get mine from the Auction House! I believe this is like many of the past "Bucket List" challenges and you can create your own, do a friend's or community featured, not limited to the "Australian Bucket List"
And the wording here is specifically 'Complete' and NOT Win or Beat. Looking forward to the 959 and the '82 Turbo! Only available through Forzathon or the Auction House, just like most of the previous Forzathon cars. If you don't do the #Forzathon Challenge I'm sure someone will give you the pleasure of spending millions of CR on the Auction House. 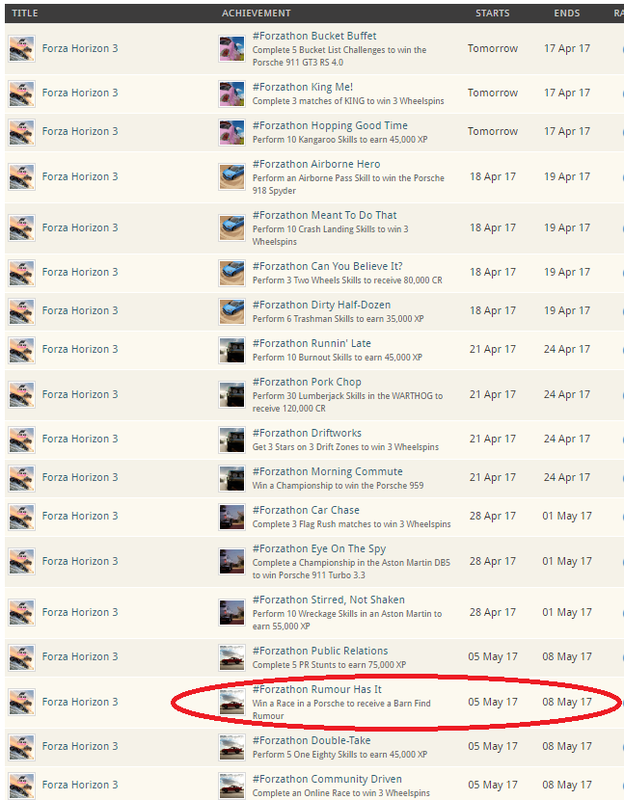 I have just found my old ones from other Forzathons and added a few more for tomorrow's Forzathon in my Bucket List Very Easy to do set!!!! Thanks JU1CE for the idea. Where can I check the forzathon calendar? I just started in the game and I don't want to miss forzathons anymore. Thanks in advance. The calendar is on the new Porsche article. 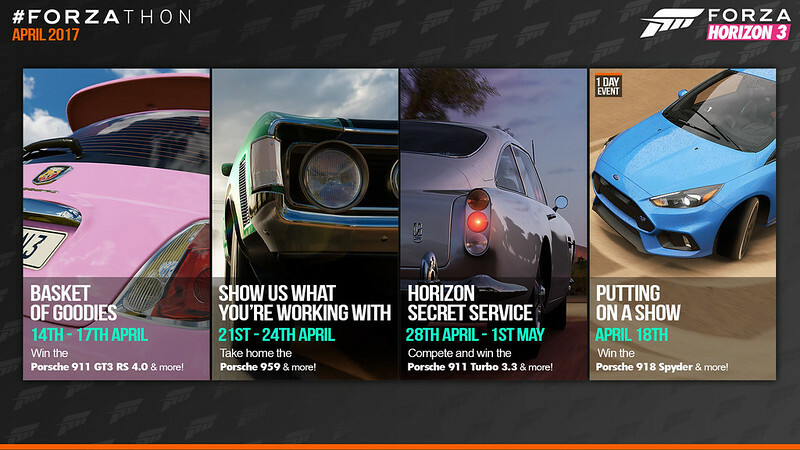 You can also search in Google "April Forzathon" and you should be able to find a picture. Lamborghini Guy. Also like Ford, Ferrari, Porsche, VW, Land Rover, and Lotus. It's strange but I don't see yet this month #Forzathon achievements on my locked achievements list. Second thing. If I create my own 5 Bucket Challenges and complete them will I get car anyway? Or it has to be created by someone else? I'm yet to buy the game but will be getting it very soon. Would it still be possible for me to acquire all the previous Forzathon cars and if so, how? Forzathon cars are only offered during the Forzathon period. However, they may offer the cars again at a later date or you can get them on the Auction House. Given that the 1st 2 qualifier events for the recreation league require Porsches that are Forzathon rewards, it can be reasonably assumed that the 911 GT2 RS and Carrera GT will be offered as Forzathon rewards in May. If that is the case, it's great to see that everyone can get the chance to drive a Porsche in FH3 regardless if they buy the car pack or not and that FM7 can have them at launch as part of the base game with car packs containing additional Porsche models throughout FM7's DLC cycle instead of having to drop $20 on an expansion due to how EA handled their exclusive license. On the subject of bucket list challenges, you should be able to do any combination of 5 community bucket list challenges or bucket list challenges the game offers. I would like if they just made the cars available in the autoshow when the game reaches the end of its dlc cycles for people who get the game after Motorsport 7. Dated in the traditional style now. If only it were that simple. Let the crying, whining and gnashing of teeth commence. Dates or not even if it's on the same page as the post. Doubt it will make a difference. NEON signs one day only 918 forzathon. APRIL 18th ONLY. you must play and perform an airborne pass on TUESDAY April 18th. Wish we could gift cars. If we could we could create game thread of: guess the number of users that will post they didn't know and how it's unfair. Side bet guess the number of users that say they are out of town (or no access to the game) and how it's unfair that it's only a single day. Doing the same blueprint bucket list 5 times, works for the Porsche. Confirmed, tracked correctly in the achievement tracker. The forzathon sales is greyed out and locked. Autoshow prices are normal so the sale has not started. Anyone know a short Championship for the next couple weeks?